Walter Emanuel Larson was born June 6, 1888, on the family farm in Farmington Twp., Waupaca Co., WI, and died July 5, 1961, in Washington, DC, at age 73. Buried in Washington National Cemetery, Suitland, Prince George Co., MD. He is the son of Olaus Larsson of Fröbbestorp, Torsas, Kalmar Co., Småland, Sweden, and Catarina Olivia Wilhelmina Larsdotter of Varna Parish, Östergőtland Co., Sweden. Helen M. Frazer was born May 12, 1892, in Pittsburgh, Allegheny Co., PA, and died June 28, 1978, at a local nursing home, Oklahoma City, Oklahoma Co., OK, at age 86. Buried in Washington National Cemetery, Suitland, Prince George Co., MD. She is the daughter of William H. Frazer of County Down, Ireland, and Elizabeth E. "Lizzie" Montgomery of Pennsylvania. Walter Emanuel Larson (age 28), a bachelor, and Helen M. Frazer (age 24), a maiden, were married October 11, 1916, in Pittsburgh, Allegheny Co., PA.
Olive Wilma Larson: Born December 4, 1917, in Pittsburgh, Allegheny Co., PA; Died October 8, 1987, in Oklahoma City, Oklahoma Co., OK (age 69). Buried in Rose Hill Burial Park, Oklahoma City, Oklahoma Co., OK. Married October 18, 1941, in Wilkinsburg, Allegheny Co., PA, to Robert Witherbee Worthing: Born March 8, 1918, in Cleveland, OH; Died December 22, 1998, in Oklahoma City, Oklahoma Co., OK (age 80). Buried in Rose Hill Burial Park, Oklahoma City, Oklahoma Co., OK.
Elizabeth Ellen Larson: Born June 16, 1920, in Pittsburgh, Allegheny Co., PA; Died January 3, 2002, in Carmichael, Sacramento Co., CA (age 82). Buried in Sierra Hills Memorial Park, Sacramento, Sacramento Co., CA. Married June 24, 1944, in Wilkinsburg, Allegheny Co., PA, to Richard Kepple Steele: Born March 21, 1920, in Pennsylvania; Died October 18, 1996, in Sacramento Co., CA (age 76). Buried in Sierra Hills Memorial Park, Sacramento, Sacramento Co., CA. William H. Frazer was born May 5, 1860, in County Down, Ireland. 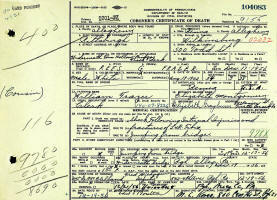 Walter Emanuel Larson was born June 6, 1888, on the family farm in Farmington Twp., Waupaca Co., WI. 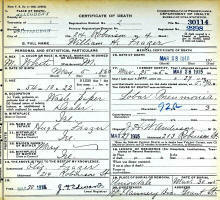 Helen M. Frazer was born May 12, 1892, in Pittsburgh, Allegheny Co., PA. The 1900 U. S. Census taken on June 13, 1900, shows Olias Larson (age 49) born April 1851 in Sweden to Swedish-born parents and having immigrated in 1872 is a Farmer who owns his farm free of a mortgage and is living in Farmington Twp., Waupaca Co., WI. Living with him is his wife of 26 years, Olivia Larson (age 52) born January 1848 in Sweden to Swedish-born parents and having immigrated in 1873, with six of the seven children born to her still alive. Also living at home are his four unmarried children, all born in Wisconsin to Swedish-born parents: Arthur Larson (age 19) born January 1881; Elmer Larson (age 14) born June 1885; Walter Larson (age 11) born June 1888; and Freedia Larson (age 8) born September 1891. The 1900 U. S. Census taken on June 11, 1900, shows William Frazer (age 40) born May 1860 in Ireland to Irish-born parents and having emigrated in 1880 and a Naturalized Citizen is a Day Laborer renting his home at 65 Van Braam, 6th Ward, City of Pittsburgh, Allegheny Co., PA. Living with him is his wife Elizabeth Frazer (age 33) born March 1867 in Pennsylvania to Pennsylvania and Irish-born parents. Also living there is their daughter, Helen Frazer (age 8) born May 1892 in Pennsylvania to Irish and Pennsylvania-born parents. The Roland Marshall family also is renting at the same address. The 1905 Wisconsin State Census taken on June 1, 1905, shows Olaus Larson (age 54) born in Sweden to Swedish-born parents, is a married Farmer, and who owns his farm free of a mortgage, and is living in Farmington Twp., Waupaca Co., WI. Living with him are: his wife, Katharine O. Larson (age 57) born in Sweden to Swedish-born parents; his unmarried daughter, Edith C. Larson (age 22), born in Wisconsin to Swedish-born parents, who Does Housekeeping; his unmarried son, Elmer Larson (age 19) born in Wisconsin to Swedish-born parents, a Farm Laborer; his unmarried son, Walter E. Larson (age 17) born in Wisconsin to Swedish-born parents, a Farm Laborer; his daughter, Freeda M. Larson (age 13) born in Wisconsin to Swedish-born parents; his granddaughter, Myrtle Larson (age 3) born in Illinois to Illinois and Wisconsin-born parents; his granddaughter, Hazel Larson (age 2) born in Illinois to Illinois and Wisconsin-born parents; and his grandson, Paul E. Larson (age 4/12) born in Illinois to Illinois and Wisconsin-born parents. Walter Emanuel Larson, age 19, graduated from high school in June, 1907, but then had a recurrence of the lung involvement that he had in his first year of high school. The doctor advised going west, so he and his brother Almo Joshua Larson, age 22, decided to go out to the state of Washington. The 1910 U. S. Census taken on April 20, 1910, shows William H. Frazer (age 49) born in Ireland to Irish-born parents and having emigrated in 1883 and a Naturalized Citizen is a Proprietor of a Waste Paper Business owning his home with a mortgage and living at 214 Robinson Street, 4th Ward, City of Pittsburgh, Allegheny Co., PA. Living with him is his wife of 20 years, Elizabeth Frazer (age 43) born in Pennsylvania to Pennsylvania and Irish-born parents, with 2 of the 3 children born to her still alive. Also living there are his two unmarried daughters, both born in Pennsylvania to Irish and Pennsylvania-born parents: Helen Frazer (age 18); and Rees Frazer (age 8). Also living there is William's niece, Elizabeth Palmer (age 12) born in Ohio to Canadian and Pennsylvania-born parents. Leigh Larson note: Elizabeth Palmer is Elizabeth Frazer's niece. Elizabeth Frazer's maiden name was Montgomery (This information courtesy of Linda Ferguson, Toronto, Ontario, Canada). 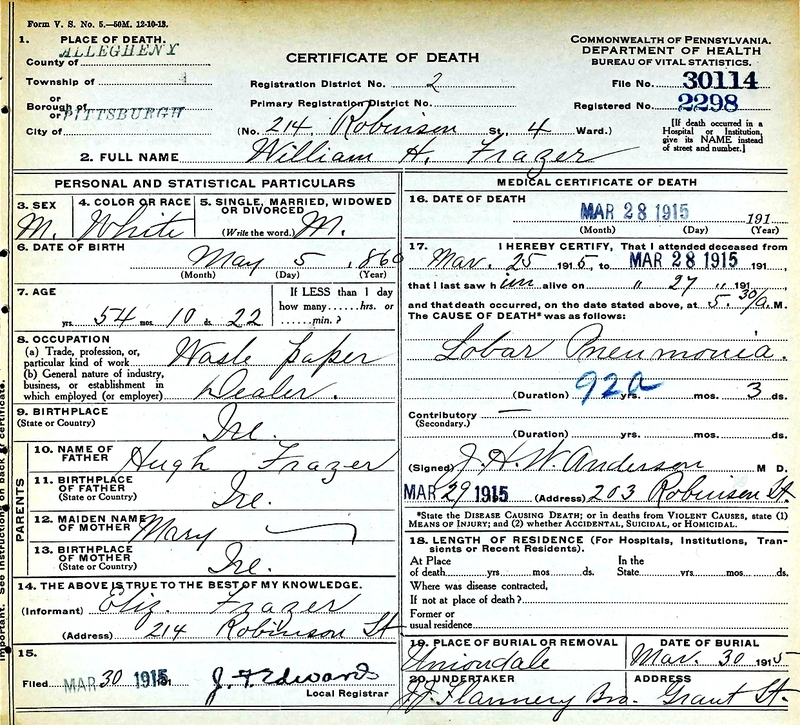 William H. Frazer died March 28, 1915, at 214 Robinson Street., 4th Ward, City of Pittsburgh, Allegheny Co., PA, at age 54. 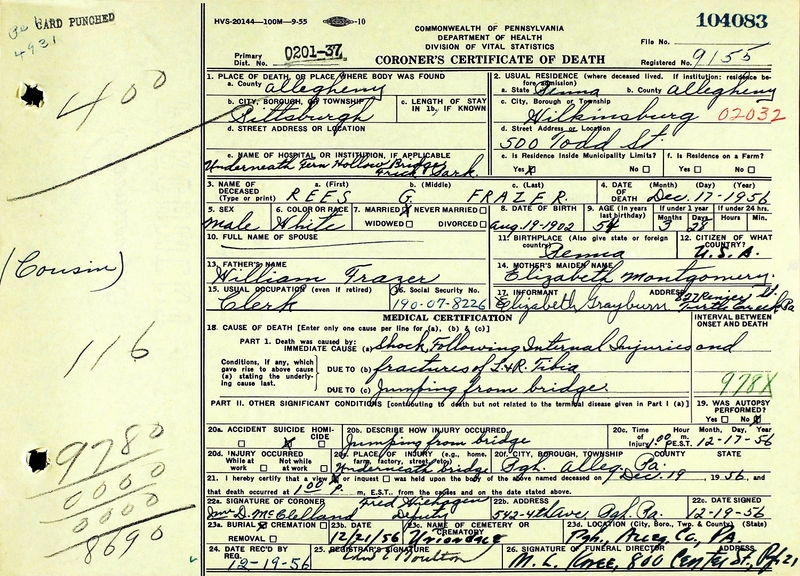 Buried in Union Dale Cemetery, Pittsburgh, Allegheny Co., PA.
William H. Frazer Death Certificate. William H. Frazer, aged 55, of 214 Robinson street died at his home yesterday morning from pneumonia He was born in Ireland and came to this country 40 years ago and for the past 38 years had been a resident of this city. He was engaged in the paper stock business in Walter street. Mr. Frazer was a member of the Henry Lampert Lodge, I. O. O. F., and the Oakland Baptist Church. He leaves his widow, Mrs. Elizabeth Frazer; one son, Rees Frazer, and one daughter, Miss Helen Frazer. On Sunday, March 28, 1915, at 5:30 a. m., William H. Frazer, beloved husband of Elizabeth Frazer. Funeral services at his late home, 214 Robinson street, Oakland, on Tuesday afternoon, March 30, at 2:30 o'clock. Members of Henry Lambert Lodge, Odd Fellows; the Oakland Baptist Church and friends of the family are respectfully invited to attend. In the parsonage of the Oakland Baptist Church, Miss Helen M. Frazer, daughter of Mrs. Elizabeth Frazer of East End avenue, was quietly married Wednesday morning to Walter E. Larson of Waupaca, Wis., Rev. Dr. H. M. Cook officiating. The bride was gowned in gray taffeta and Georgette crepe and wore a corsage bouquet of orchids and white roses. After a dinner at the bride's home, the couple left for the East. They will be at home after November 1 in Sheraden. 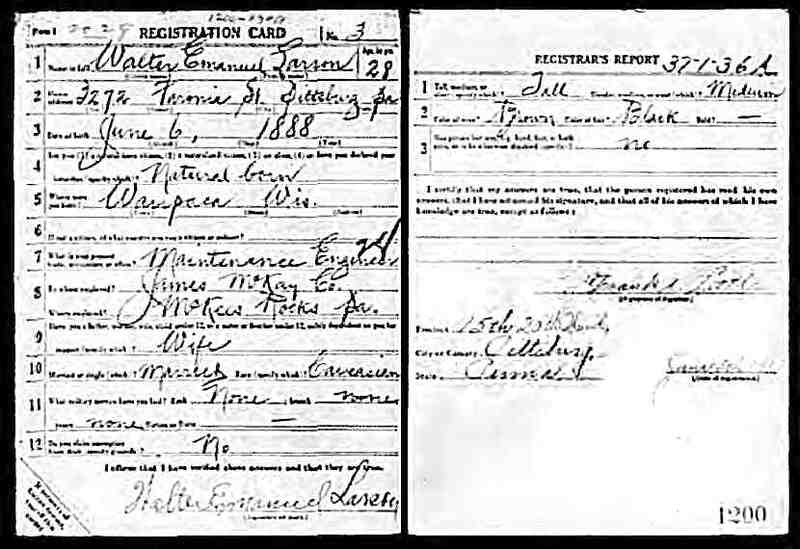 The WWI Draft Registration Report taken on June 5, 1917, shows Walter Emanuel Larson (age 28) born in Waupaca, WI, is a married Maintenance Engineer working for the James McKay Co. of McKees Rocks, PA (near Pittsburgh), and living at 3272 Faronia Street, Pittsburg, PA. Tall height, Medium build, Brown eyes and Black hair. The 1920 U. S. Census taken on January 5, 1920, shows Elizabeth Frazer (age 52) born in Pennsylvania to Pennsylvania and Irish-born parents is a widow owning her own home and living at 579 East End Ave., 14th Ward, City of Pittsburgh, Allegheny Co., PA. Living with her is her unmarried son, Rees B. Frazer (age 17) born in Pennsylvania to Irish and Pennsylvania-born parents, who is a Clerk at a Steel Company. 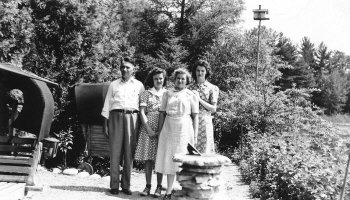 Also living with her are her two unmarried nieces, both born to Canadian and Pennsylvania-born parents: Elizabeth W. Palmer (age 22) born in Pennsylvania, a Stenographer at a Laboratory Company; and Minnie Palmer (age 17) born in Ohio, a Check Girl at a Telegraph Company. 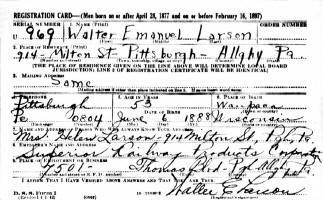 Also living at this address: Walter E. Larson (age 31) born in Wisconsin to Swedish-born parents, an Engineer at a Manufacturing Company who is renting his home at 579 East End Ave., 14th Ward, City of Pittsburgh, Allegheny Co., PA. Living with him is his wife, Helen Larson (age 27) born in Pennsylvania to Irish and Pennsylvania-born parents. Also living there is his daughter, Olive W. Larson (age 2) born in Pennsylvania to Wisconsin and Pennsylvania-born parents. Leigh Larson note: Elizabeth Frazer is the widowed mother of Helen (Frazer) Larson. The 1930 U. S. Census taken on April 14, 1930, shows Walter E. Larson (age 41) born in Wisconsin to Swedish-born parents and first married at age 28 is a Mechanical Engineer at Jaels Manufacturing Company owning his home valued at $12,000 at 914 Milton St., 14th Ward, City of Pittsburgh, Allegheny Co., PA. Living with him is his wife, Helen Larson (age 37) born in Pennsylvania to Irish and Pennsylvania-born parents and first married at age 24. Also living there are his two daughters, both born in Pennsylvania to Wisconsin and Pennsylvania-born parents: Olive W. Larson (age 12); and Betty E. Larson (age 9). 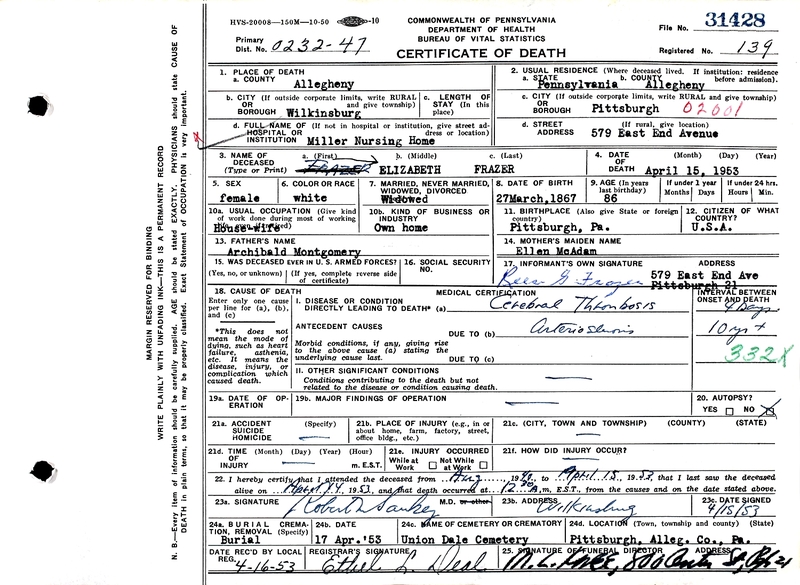 The 1930 U. S. Census taken on April 7, 1930, shows Elizabeth E. Frazer (age 63) born in Pennsylvania to Pennsylvania and Northern Ireland-born parents is a widow owning her own home valued at $7,320 and is living at 416 West Street, 3rd Ward, Wilkinsburg Borough, Allegheny Co., PA. Living with her is her unmarried son, Rees G. Frazer (age 27) born in Pennsylvania to Pennsylvania-born parents, a Public Utilities Clerk. 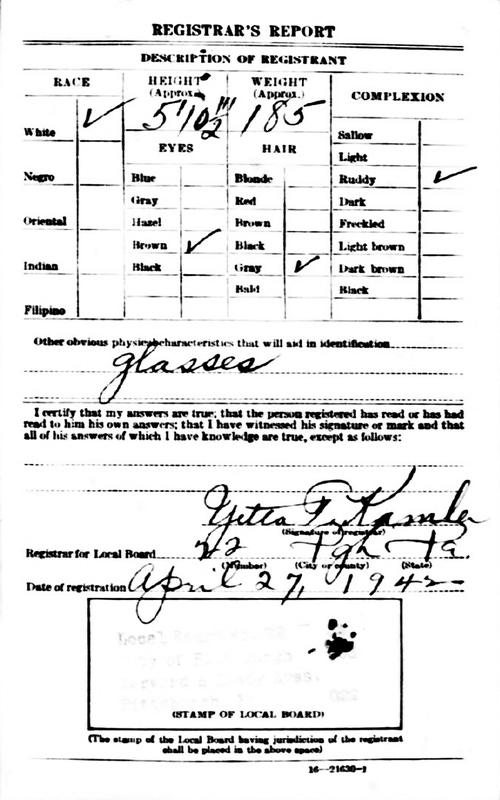 The 1940 U. S. Census taken on April 9, 1940, shows Elizabeth E. Frazer (age 73) born in Pennsylvania, and 5 years ago was living in the Same House, and with 8 years of School, is a widowed Head of Household, and who owns her home valued at $6,000 and is living at 579 East End Ave., 14th Ward, City of Pittsburgh, Allegheny Co., PA. Living with her is her unmarried son, Rees G. Frazer (age 37) born in Pennsylvania and 5 years ago was living in the Same House, and with 2 years of High School, an Account Clerk in the Gas Industry. The 1940 U. S. Census taken on April 16, 1940, shows Walter E. Larson (age 51) born in Wisconsin, and 5 years ago was living in the Same House, and with 4 years of College, and is Mechanical Engineer at a Railroad Equipment Factory, and owns his home valued at $8,500 and is living at 914 Milton St., 14th Ward, City of Pittsburgh, Allegheny Co., PA. Living with him are: his wife, Helen F. Larson (age 47) born in Pennsylvania, and 5 years ago was living in the Same House, and with 4 years of High School: his unmarried daughter, Olive Larson (age 22) born in Pennsylvania, and 5 years ago was living in the Same House, and with 4 years of High School, a Typist of Life Insurance; and his unmarried daughter, Elizabeth Larson (age 19) born in Pennsylvania, and 5 years ago was living in the Same House, and with 2 years of College. 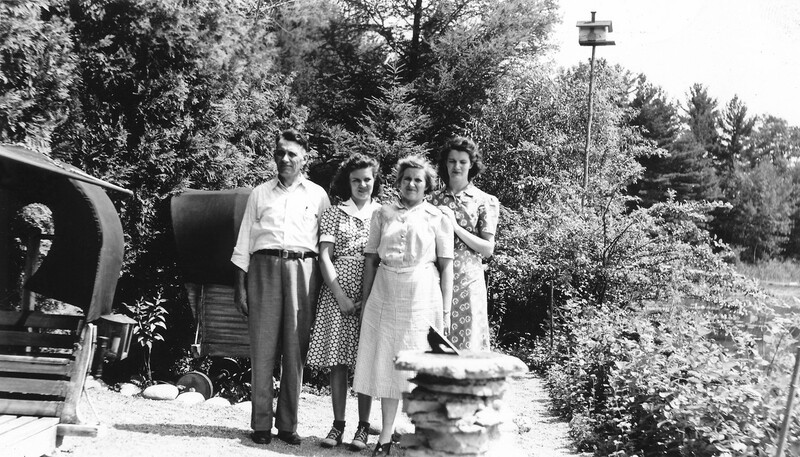 Almo Joshua Larson, Elizabeth Ellen "Betty" Larson, Helen M. (Frazer) Larson, and Olive Wilma Larson, at the Chain o'Lakes, Waupaca Co., WI, about 1940. 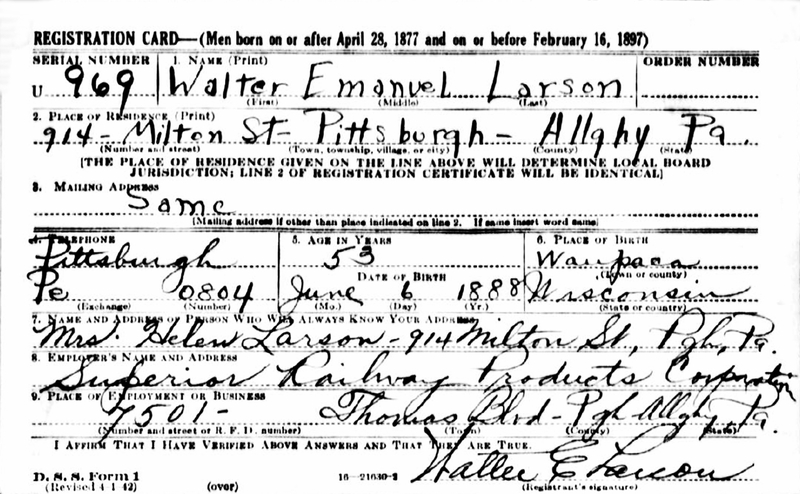 The WWII Draft Registration Report taken on April 27, 1942, shows Walter Emanuel Larson (age 53) born in Waupaca, WI, is working for the Superior Railway Products Corp., 7501 Thomas Blvd., Pittsburgh, Allegheny Co., PA and living at 914 Milton Street, Pittsburgh, PA. He is 5'- 10" Tall, 200 Lbs., Gray Eyes, Gray Hair, and Light Brown Complexion. Mr. and Mrs. Walter E. Larson of Regent Square, have announced the engagement of their daughter, Miss Betty Ellen Larson, to Richard Kepple Steele, son of Mr. and Mrs. Donald C. Steele, also of Regent Square. Miss Larson and Mr. Steele are both graduates of the University of Pittsburgh, where she was a member of Zeta Tau Alpha, and he of Sigma Tau. Elizabeth W. "Lizzie" (Montgomery) Frazer died April 15, 1953, at Miller Nursing Home, Wilkinsburg, Allegheny Co., PA, at age 86. 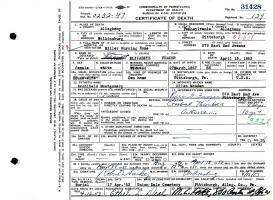 Buried in Union Dale Cemetery, Pittsburgh, Allegheny Co., PA.
Elizabeth W. "Lizzie" (Montgomery) Frazer Death Record. FRAZER - Elizabeth Montgomery of 579 East End Ave., Pgh, 21, on Wednesday, April 15, beloved mother of Mrs. Helen Larson and Rees G. Frazer; aunt of Mrs. Elizabeth Grayburn and Mrs. Minnie Sage; also two granddaughters and five great-grandchildren. Friends may call at the Knee Memorial Home, Center (at South), Wilk. Services on Friday afternoon at 1:30 o'clock. Flowers gratefully declined. Rees Griffith Frazer died December 17, 1956, underneath the Fern Hollow Bridge, in Frick Park, Pittsburgh, Allegheny Co., PA, at age 54. 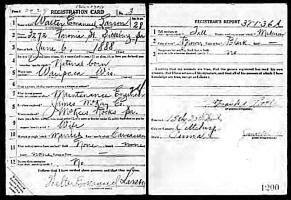 Buried in Union Dale Cemetery, Pittsburgh, Allegheny Co., PA.
Rees Griffith Frazer Death Record. The body of a Wilkinsburg man, missing since Sunday, was found yesterday afternoon under the Fern Hollow Bridge, Frick Park. Ironically, the body of the victim, Reese Frazer, 54, of 500 Todd Street, Wilkinsburg, was sighted by a niece who had gone to look for him. Helen Fage, 27, of 827 Renier Street, Turtle Creek, said she started looking for her uncle when she was unable to reach him by phone on Sunday. She told police Frazer lived alone and had been suffering from a nervous condition. Walter Emanuel Larson died July 5, 1961, in Washington, DC, at age 73. Buried in Washington National Cemetery, Suitland, Prince George Co., MD. Helen M. (Frazer) Larson died June 28, 1978, at a local nursing home, Oklahoma City, Oklahoma Co., OK, at age 86. Buried in Washington National Cemetery, Suitland, Prince George Co., MD. Private services for Mrs. Helen F. Larson, 86, of 6500 N Portland, are being arranged by Hahn-Cook, Street & Draper Funeral Home. Burial will be in Washington National Cemetery, Washington, D.C. Mrs. Larson died Wednesday in a local nursing home. She was born in Pittsburgh, Pa., and moved to Oklahoma City in 1961. She had been a volunteer worker at Baptist Medical Center and was a member of May Avenue United Methodist Church. Survivors include two daughters, Mrs. Olive L. Worthing, Oklahoma City, and Mrs. Betty L. Steele, Carmichael, Calif.; seven grandchildren, and four great-grandchildren. Memorials may be made to the Oklahoma Medical Research Foundation.